— This article by Jerry Cates and Tom Sinclair, first published on 15 June 2010, was last revised on 24 April 2016. © Bugsinthenews Vol. 11:06(01). It is obvious why Tom, one of the most experienced herpetologists in the world, could have been fooled — if only for an instant — into mistaking this particular eastern hog-nosed snake for a western pygmy rattlesnake. They are remarkably similar, and — most likely — the resemblance is not coincidental. You may be aware that eastern hog-nosed snakes are among the most varied, in coloration and markings, of all the snake species that are found in North America. But why would this be so? Why would this particular species assume so many different guises in the varied locales where it is found? I’ve pondered that many times, and yet we know there are good answers to the question if we look for them. Mother Nature doesn’t do anything without good reason, though sometimes we have to bend our minds a bit to understand how the natural world behaves. Were that not true, we wouldn’t be as enthralled at the allusions we find in The Red Queen Principle of Selective Adaptation. 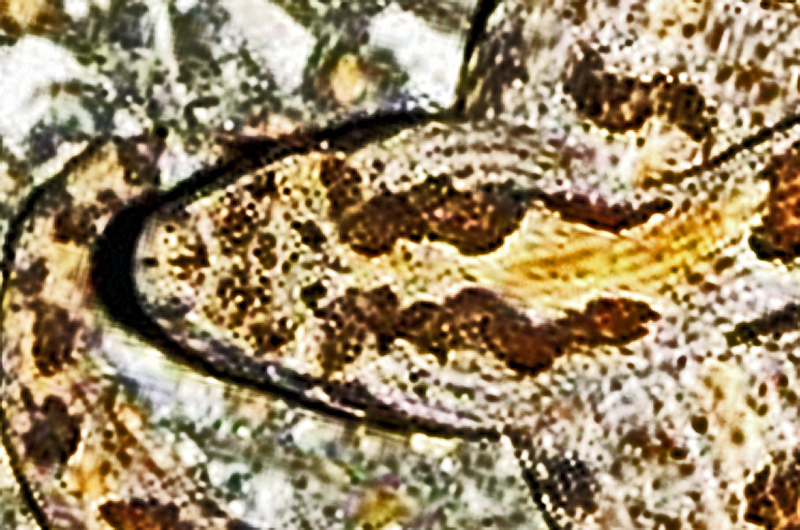 Elucidation on that question will come later in this post, but first take notice of some of the obvious similarities of the markings on the heads and bodies of these serpents. As we do that, I should caution you against expecting absolutely impeccable mimicry; it isn’t necessary for the mimic to be a perfect copy of the species it is mimicking in order for the purpose of the act to be achieved. —-Both have an orange spinal wash, on a gray background. —-Both have a pair of dark, elongated markings on the dorsal head. —-Both have short, dark lateral bars, wider than long, on the spine, and similar dark markings on the lateral body. —-And both have caudal (tail) markings that appear more as bands than as saddles. Interesting, don’t you think? Now, let’s delve into the question of why this might take place. Mimicry of this nature isn’t likely to occur unless it confers some advantage upon the mimic. Who would that be, by the way? Let’s make sure we understand who is the mimic, and who is being imitated (the model the mimic is copying), before continuing. In this case, it seems clear that the eastern hog-nosed snake is the mimic. There are at least two reasons for this. First, the eastern hog-nosed snake tends to vary its coloration and markings with considerable facility, even within small localized areas, while the western pygmy rattlesnake (the model) tends to maintain a fairly stable color pattern throughout its range. 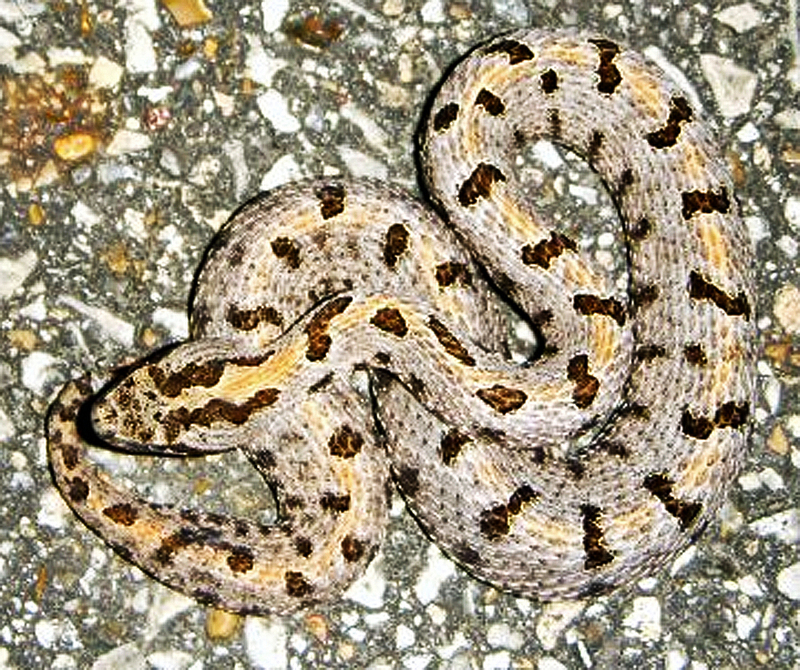 Second, the eastern hog-nosed snake is essentially harmless to its potential predators, while the pygmy rattlesnake is capable of delivering a painful, debilitating bite to a molester, one that — while unlikely to be fatal — produces a long-lasting, life-altering wound that predators are likely never to forget. So what advantage is coferred upon the eastern hog-nosed snake by just happening to look like (i.e., to mimic, albeit unintentionally) a western pygmy rattlesnake? 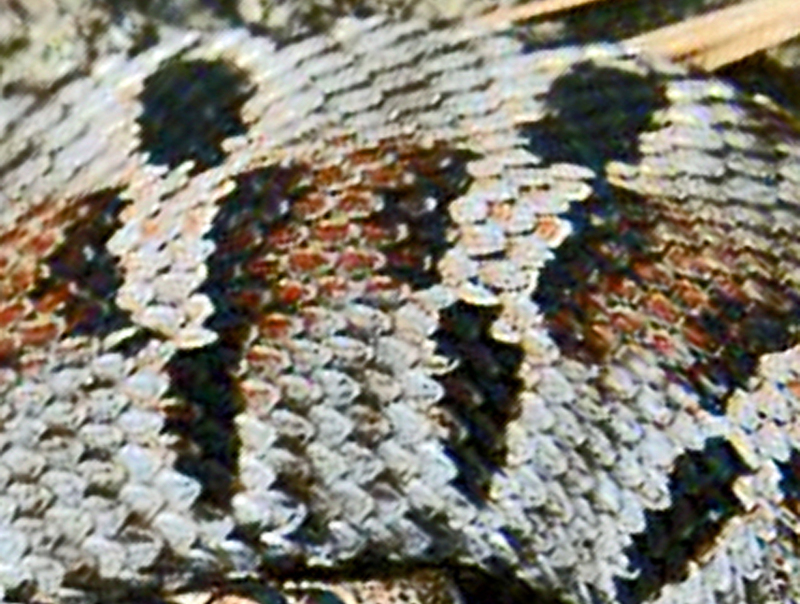 Any animal that encounters a western pygmy rattlesnake and gets bitten will likely suffer the pain and agony that follows such a bite. 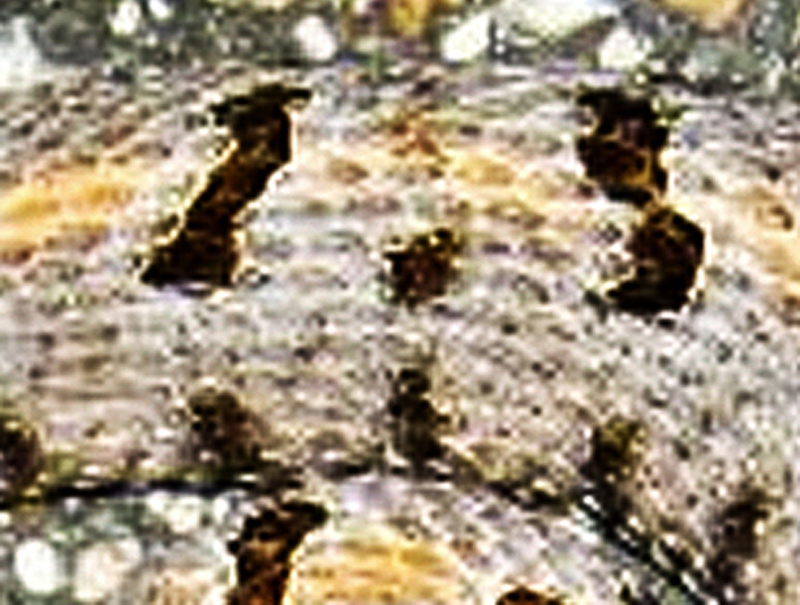 Most animals large enough to be successful predators of the pygmy rattler will not die from the bite, but will have to endure a lengthy, painful, and remorseful (i.e., memorable) period of recuperation: such animals learn from the encounter and its memorable aftermath that it is not wise to mess with such rattlers in the future. 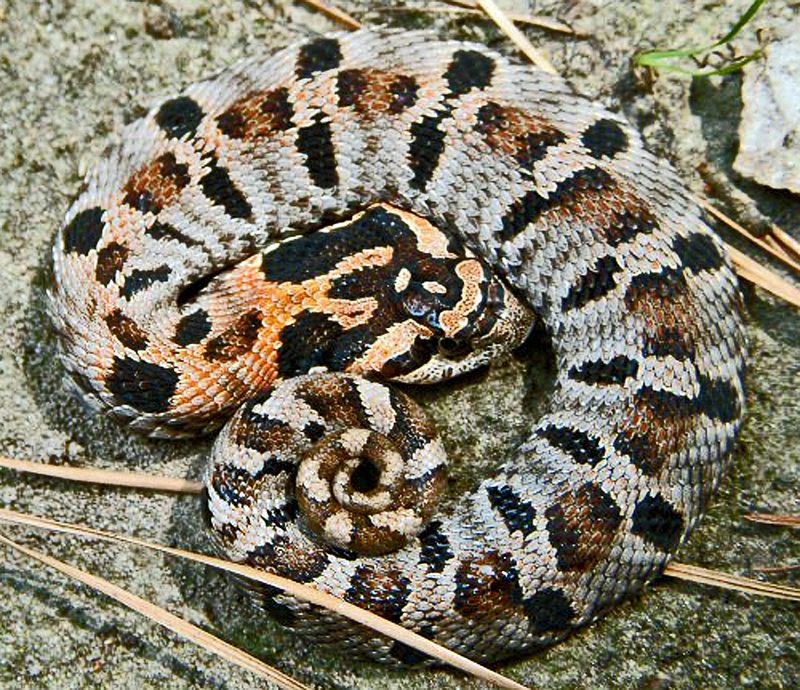 As a result such animals — by connecting cause and effect — thereafter avoid any snake that even looks like (mimics) a western pygmy rattlesnake. Voila! Any eastern hog-nosed snake that resembles a western pygmy rattlesnake is granted an added measure of protection from a host of “educated” animals that might otherwise kill and eat it. Now consider this: because the eastern hog-nosed snake’s DNA allows for a wide range of colors and markings, a given locale will potentially habitate a population of eastern hog-nosed snakes sporting many if not most of those variations, at least initially. What if that locale is within the range of another serpent, like the western pygmy rattlesnake, that produces a marked avoidance reaction in animals that prey on snakes? 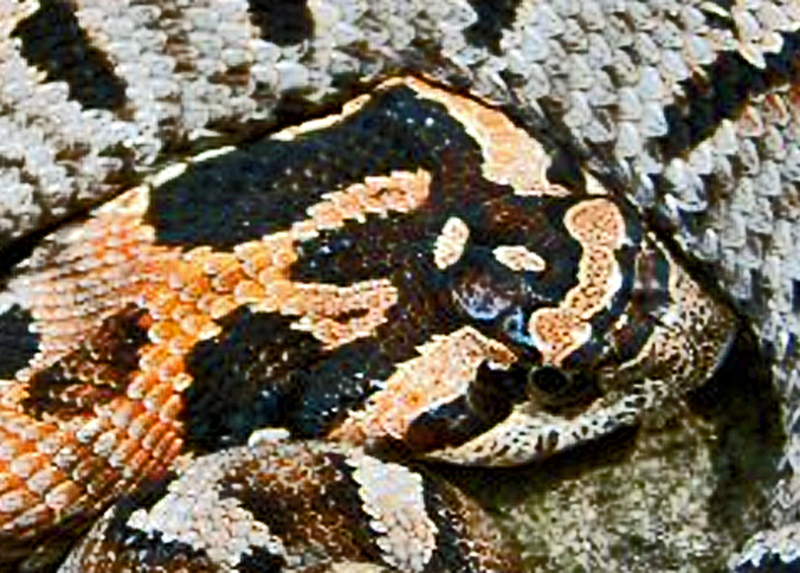 All the eastern hog-nosed snakes that look somewhat like the western pygmy rattlesnake will have a better chance of survival, while those without such mimicry will — ceteris paribus (that is, all other things remaining equal) –— tend to fall victim to predators more often, leaving fewer of them to reproduce and be observed. Over time, within the range of the western pygmy rattlesnake the eastern hog-nosed snakes will tend to look more and more like them. Editor’s Note: Tom cuts right to the meat of the matter. Methinks it is about time to post some material–in a future post or set of posts–on the nature of mimicry in general. That material will go into more detail about the specific form (Batesian) of mimicry involved in the subject matter of this post, where the non-venomous species (the Heterodon) mimics the venomous one (the Sistrurus) to achieve protection from a common predator. Another form (Mullerian) will also have to be discussed in that material; Mullerian mimicry, which involves two venomous or otherwise harmful organisms (comimics or comimes) who mimic each other as a means of accentuating a shared need. These comimes benefit by eliciting avoidance reactions from a common set of predators which, in this case, are not actually dupes, but more properly signal receivers who also benefit from the avoidance reaction.